This is a partial preview. Full document is 174 pages. View large preview. The "Deliver Business Value with IT" series provides a good overview and actionable material of the ways a CIO can provide valuable and effective support to your company strategy and leverages business model concepts to deliver business value from IT. Martin Palmgren propose an extremely solid piece of work that comes across as the A-Z reference of how to execute and implement IT strategy from a CEO and CIO level perspective." The CIO and the IT Department need to position as premium provider of IT services and focus on value to cost. In order to avoid the "do we really need a CIO and IT department to bother us with technology when we can use the cloud?" the CIO has to ensure that the business strategy and business objectives are supported by IT (from a Business and IT architecture perspective). Where the IT Strategy support Strategy execution, "Time to Market", Cost Effectiveness and stakeholder expectations from an Executive, Business Unit, IT Management and IT Risk Management perspective. To deliver business value with IT we need to Focus on the Business Bottom Line: How fast can we get our products and services to market 'Time to Market' & how can the IT department support the business from a Cycle Time and Cost Effectiveness perspective. The IT Bottom line is that up to 40 % of current IT spend occurs outside the IT budget (CRM, Cloud). The IT department needs to position itself as a facilitator to IT services and effectively address emerging needs, market opportunities and demonstrate that the current Business Model is supported effectively. The IT department should facilitate the access to IT services to support new and current business initiatives. 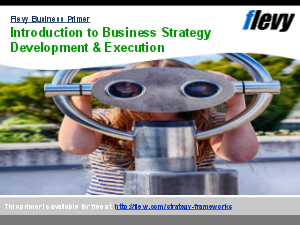 The business strategy emerge out of a number of initiatives that are successful or not. The IT department need to support the 'Run' of day-to-day operations as well as new projects. The Cloud might particularly be of interest within this frame. - What is the Business's strategy and plans? - What is the current business model that IT has to support? - Where could IT make a significant impact on the business? - Are there any further opportunities to use IT? - How do we provide IT Services as we meet demand and cost drivers where the decision is to make (internal) or to buy (external service provider)? We have identified 2 key trends for the CIO to focus on: - Differentiation (That is, how does IT provide a competitive advantage for the business), and - Cost (How does the IT Department deliver IT Services cost effectively). To do so we need to Build an effective IT Delivery Model to meet business needs and expectations as we leverage business strategy execution and business processes supported by an IT Service strategy (ITIL, IT - CMF, CobIT 5 (ValIT, CobIT 4.1, RiskIT), ISO 38 500, TOGAF and ISO 9001, ISO 27 001, COSO) delivered in a Business IT roadmap; that is how do we support business objectives and processes leveraged by IT and an effective IT Services strategy. Within this scope we would by definition address how we execute the IT service strategy (ITIL) Design - Spell out IT Activities from a demand and supplier side, Build - Set IT processes and key performance indicators, Run - Aligned to described ITIL activities and processes and full IT Financial Management (supported by delivery capability IT CMF, COBIT 5). Once services defined we can then decide where to run the application that support the IT and or Business Services (server / internal / external cloud / outsourced provider).